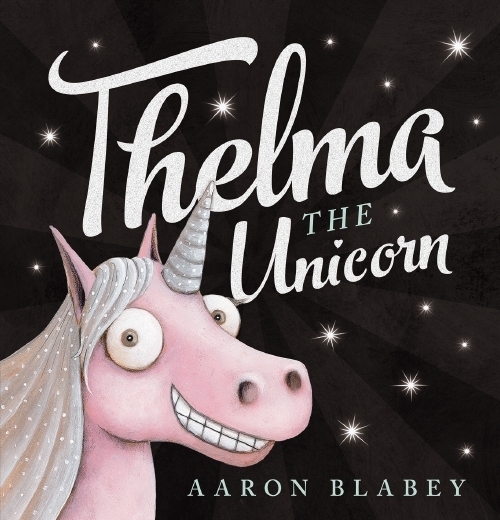 Thelma the Unicorn is a picture book written and illustrated by Australian children's book author and illustrator of Pig the Pug fame, Aaron Blabey. It was published in 2015 as part of a three-book deal that Blabey signed with Scholastic in 2014. Thelma the Unicorn gained critical acclaim and was a commercial hit. It graced bestseller lists and was shortlisted for the following awards: the 2016 Book of the Year Award at the Nielsen BookData Booksellers Choice Award, Picture Book of the Year 2016 at the KOALA Awards, Picture Book of the Year at the YABBA Awards, and the Picture Book of the Year at the CROC Awards. Thelma the Unicorn is a sparkly, joyful book about learning to love yourself. Thelma is a plain horse who lives in a paddock with her best friend who is a donkey named Otis. Otis is very fond of Thelma and thinks that she is fine how she is. But Thelma doesn't share his high opinion of her. She is sad and thinks that her life would be more interesting and she would be happier if she were a unicorn. Thelma decides to chase her dream and for a while is able to convince people that she is a pink and sparkly unicorn after she is doused in some pink paint and glitter. "I'm special now!" she cries. The world falls in love with Thelma and for a while she feels like her dreams have come true. But then, over time, things change. Fame begins to lose its sparkle for Thelma. Her fans start harassing her, chasing her down the street, saying mean things to her, invading her privacy, and feeling entitled to her time and attention. Thelma realises that she is sad and lonely and starts wondering if becoming famous and beautiful was really worth abandoning Otis and her old life. Thelma the Unicorn had a surprising message in it and that was that fame has a dark side to it. Being famous can be hard. Some people will troll you online, other people will love you so much they will make you feel smothered, and you will no longer have any privacy. Be careful what you wish for. Sometimes the life you wish you had might not be any better than the life you want to leave behind. I wondered when reading this book if Blabey was speaking from experience when he talked about how awful being famous can be sometimes. Has he had some bad experiences himself with some of his fans? Was he trying to make a statement about online trolling, social media and the obsession we have with celebrities? The illustrations in this book were once again very hilarious. Blabey has a real talent with drawing expressive faces. My favourite page showed Thelma sitting in bed, her horn askew and her makeup smeared, clutching a framed picture of her friend Otis and looking very sad. You couldn't help but feel very bad for her! Thelma the Unicorn is a story about wishes and dreams, the bad side of fame and fortune, the negative thoughts we have about ourselves, self-worth and friendship. It's another classic from the brilliant Aaron Blabey. Why? Thelma is an ordinary horse who thinks that she would be much happier if she were a famous and beautiful unicorn. When: You could read Thelma the Unicorn to your child and then have a discussion with them about fame, identity, friendship, confidence and wishes and dreams.